While counting continues today and Australia could see some surprising results, the Coalition continues to blame others for the swing against them. The truth is the seed for the Coalitions poor results were planted when the Abbott/Turnbull Government pursued the far-right conservative policies pushed by and developed by the IPA. The cuts to the CSIRO, health and the destruction of the manufacturing industry in places like Victoria have all played a part in the poor results for the Coalition. The Australian electorate are having a difficult time accepting and trusting the Coalition because they have systematically attacked Australian civil society. The Coalition has been, and if they do win will continue to, hold Australia back when it comes to renewable energy, education and health. The treatment, pursued by the coalition, of people seeking asylum and refugees at tax payers expense has also sickened Australians and lead to them not trusting the Coalition. The Coalition also rejects the views of Australians and treats them with contempt. They have shown scorn for Australians with poor governance and modelling bad behaviour. 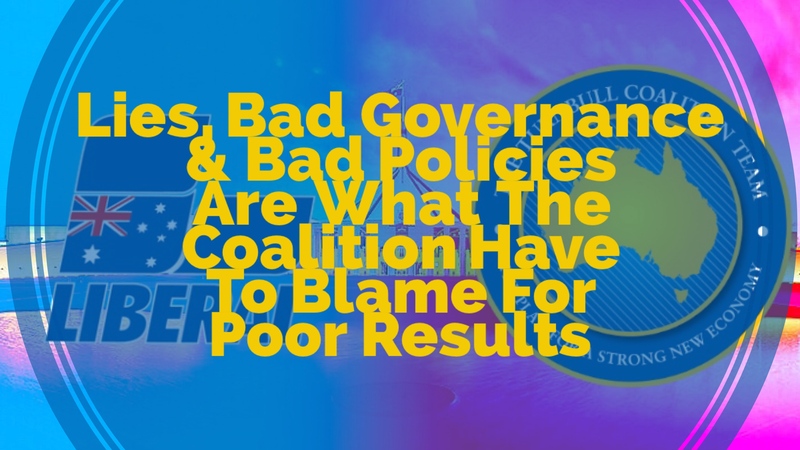 The Coalition has never sat back and looked at themselves to see what they are doing wrong and how to fix it. The Coalition has become an inept spineless party and Australians are tired of climate deniers, racists and homophobes that litter the Coalition. The brand is damaged and will take a long time to recover, if at all.